Aqua, Octocrylene, Glycerin, Isopropyl Palmitate, Glyceryl Glucoside, Glyceryl Stearate Citrate, Butyrospermum Parkii Butter, Dimethicone, Hydrogenated Coco-Glycerides, Methylpropanediol, Butylene Glycol, Caprylic/Capric Triglyceride, Cyclomethicone, Lauroyl Lysine, Panthenol, Cetyl Alcohol, Stearyl Alcohol, 4-Butylresorcinol, Glycyrrhetinic Acid, Sodium Carbomer, Acrylates/C10-30 Alkyl Acrylate Crosspolymer, Trisodium EDTA, Diethylhexyl Syringylidenemalonate, BHT, Ethylhexylglycerin, 1,2-Hexanediol, Phenoxyethanol, Parfum. First of all, Eucerin Even Brighter Pigment Reducing Night Cream comes in a large heavy-ish jar with a screw on top. The jar itself seems well built and of excellent quality but I think its too bulky for the amount of product inside. While I say the quality of the packaging is fantastic, the design itself is not so. The jar-style encourages not only bacterial colonisation with double dipping of products but I also worry it runs the risk of exposure of and quicker deactivating of the product's ingredients. I would have much preferred either a tube or a pump style that is a lot more sanitary. I do like my night creams to provide adequate moisture to wake up with soft supple skin but for that purpose Eucerin Even Brighter Pigment Reducing Night Cream disappoints. Bearing in mind I am using this in the summer time, I sometimes wake up with my skin looking and feeling tight and dry instead of smooth feeling like I had not put any of the cream at all. I know this is not the primary purpose of this product but still I have perhaps been spoilt by other night creams I've tried. Unlike most night creams I use, Eucerin Even Brighter Pigment Reducing Night Cream does not contain retinol and I'm afraid my skin misses this ingredient! I'm unsure whether the spots on my forehead are developing are due to this cream or whether my skin just misses retinol, but one thing's for sure that with this cream - my acne is not controlled. My skin is prone to freckle formation from every little bit of sunlight - I have colonies of them on my cheeks. As far as 'brightening' them is concerned after three weeks, I am afraid I have not noticed any improvements of these. Perhaps with the cell turnover it requires much more time to work but so far I am unimpressed. 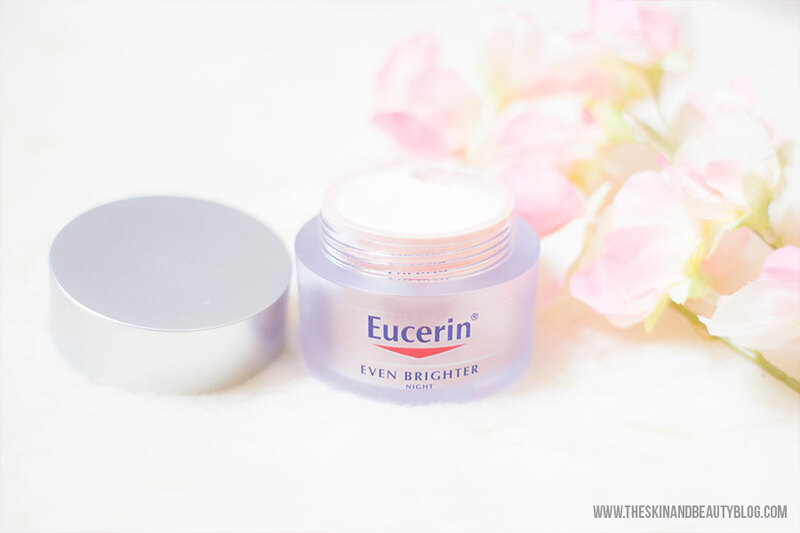 With my acne breakouts and lack of enough moisturisation, I feel perhaps even though its still early on with Eucerin Even Brighter Pigment Reducing Night Cream it may be time to move on to a different night cream that will perhaps do a better job. I really need some suggestions and would appreciate it if you can help a girl out!